In the last blog we tied yoga, composure, and the *Safe Place* together. As promised, this is a follow-up to elaborate on Composure and our Safe Places at TLS.Conscious Discipline empowers adults with the Seven Powers for Self Control. These powers allow adults to draw from within themselves to become proactive instead of reactive in moments of conflict. From the Seven Powers of Self Control emerge the Seven Basic Skills of Discipline, the first of which is composure. Composure = being the person you want others to become. When we allow our feathers to be ruffled we are role modeling ruffled feather behavior to our children. When we remain calm we are also teaching by example. It is only when we are calm that we can solve problems together and empower our children to do the same. Safe Place = A place where children can remove themselves from the group in order to become calm, regain composure and maintain control when upset, angry or frustrated. Current neurological research indicates that our brains functions optimally when we feel safe and secure. As Early Childhood teachers, we strive to make every place in our school physically and emotionally safe for children. Naming a Safe Place is a way of offering a designated place for children to gain composure and manage their feelings. We teach and help children to use the Safe Place as a resource to help them change their internal state from upset to calm or as a way to stay above the fray. After all, the most productive time-out is the one we give to ourselves. Using a Safe Place is a positive way of helping our children better understand and manage their emotions. Children come to the Safe Place in order to be helpful and not hurtful to themselves or others. The choice to be helpful instead of hurtful can only be made when a child is calm. Sometimes adults may need to direct a child to the Safe Place when it is clear that the child needs a break. 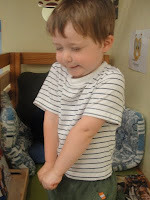 As children use the Safe place they learn that they are able to calm themselves and self regulate. Draining - Extend both arms in front of your body parallel to the floor. Clench fists tightly and continue to tighten shoulder and body muscles. Then open the drain (make shhhhh sound) and relax body as if releasing water out of a faucet. 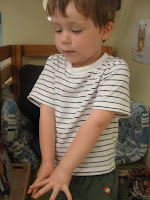 Pretzel - Stand with feet crossed, extend arms out in front and cross the left wrist over the right wrist. Interlace the fingers and bring hands up toward the chest. Close eyes and press the tongue to the roof of the mouth. Hold this position for a few seconds and slowly release. Teachers need a Safe Place, too! Ms. Wendy and Ms. Jennifer created our staff room, which is a place of retreat, community, and ahhh, coffee aroma. You could establish a Safe Place at home. Call it safe space, safe spot, safe corner, or whatever you want to call it -- make it yours and add the features that are calming and soothing for your child. Teach children to regain control themselves. Conscious Discipline suggests bean bags that are soft and hug the child, but lawn chairs, carpet squares, big pillows, etc. can also be used. Add scarves, stuffed animals, or a superhero cape. Conscious Discipline also suggests providing sensory items, such as: Scratch and sniff stickers, aromatherapy scents, scented lotions (labeled “cranky cream,” “boo boo cream,” and “concentration cream”). Include a tornado tube or aquarium (real or fake), a kaleidoscope or head phones with nature sounds. -Wave Bottle: fill 3/4 of the way with water, then add 2 tablespoons of cooking oil and a few drops of food coloring. -Slow Motion Bottle: fill with a clear thick liquid, such as light corn syrup, shampoo or hair gel. Then add small items of your choice, like fun beads, small metal scrapbook eyelets, paperclips, safety pins, glitter, etc. Seal lids with glue inside or duct tape outside the lid. Enhance mental alertness with peppermint, basil, lemon, cinnamon, rosemary. Calm nerves and relax with lavender, chamomile, rose. Little boxes with potpourri perhaps? Family pictures/albums, being able to go alone however long one needs to, learning about feelings and identifying them, and learning safe ways to express those feelings, and of of course learning to use the calming techniques. Thank you for all these extra ideas. I have just finished th CD training this past may and I am trying to get my safe place together.